You have two main concerns with purchasing yourself a set of bagpipes on eBay (or any online auction company). One, that the pipes may not be the quality that you are looking for. Two, it's a scam and you get nothing at all for your money. Below, I'll provide some background, what to look for, and how to protect yourself. Most bagpipes on eBay are made in Pakistan and are of very questionable quality. Most pipes that are made of rosewood or cocuswood come out of Pakistan, though they make some pipes from more-desired African Blackwood too, but this is more rare. (Some vintage sets were made out of cocuswood, but it's not common these days.) Also, "blackwood" in Pakistan can refer to wood that has simply been painted black! One piper explained, "Good inexpensive Pakistani pipes should be viewed as partially completed blanks." At the very least, with utmost certainly, the chanter, bag and reeds will need to be replaced—a several hundred dollar investment. The make of a set of bagpipes can be very hard to identify just from pictures—even by an expert—particularly if the photos aren't detailed. And, in the case of a scam, the photos could even be bagpipes that are not owned by the seller at all but instead pilfered from a previously sold set—at any given time, there are at least a few outright scams like this listed—seriously, these scams are on eBay all the time. If you are concerned, have the seller send you a photograph of the set on top of a current newspaper or a request a photo of a very specific part. If they can't provide it . . . run! And one scammer trick is to place a good quality chanter with a set of terrible bagpipes, e.g., a set of Pakistani bagpipes with a Sinclair chanter, thus misrepresenting the entire set as something that it is not. To quote one experienced collector: "I've bought over 20 vintage sets on eBay...two turned out to be older Pakistani drones with Henderson ivory chanters. Expensive mistakes." One piper I corresponded with purchased a set of bagpipes on eBay that were purported to be a set of Chisholm bagpipes, a rare and somewhat prized make from the early 1900sthe chanter was stamped with that name. Not only were the pipes Pakistani and had little value, the authenticity of the chanter was open to debate as well. Since he had been a new piper who didn't know any better, he didn't discover this fact until I pointed it out to him years later. All he knew was that the chanter didn't work very well for him and he had had to replace it. I'm sure he didn't get too many positive comments on the drone sound quality either! Another thing to watch out for, particularly for older pipes is mismatched parts. Sometimes a section may break or get lost and be repaired or replaced leaving a set of pipes that is no longer a complete original set. This may—or may not!—affect the sound significantly, but it may also affect the appearance of the pipes and any resale value. Here's a set of bagpipes that was listed on eBay as a set of Naills, which is a top brand of bagpipes. Appears to be a nice looking set of pipes, right? One small problem. They weren't Naills. Martin Cowell, one of the owners of David Naill Ltd., posted in April 2008 on BobDunsire.com forums warning that these were fraudulent. Upon delivery one would find, to quote: "non-concentric bores, dodgy wood, torn/rough combing and beading, etc., nickel is poor quality and imitation ivory is cheap plastic." 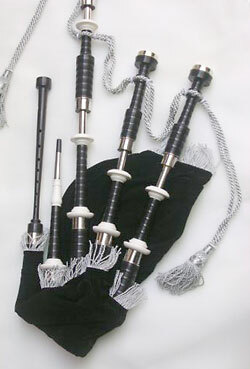 One set of bagpipes was listed in 2011 as "Vintage J&R Glen" bagpipes and included some history of the J&R Glen shop. What the seller didn't mention was that the pipes weren't actually made in the J&R Glen shop. Kintail Bagpipes bought the rights to the J&R Glen name in the early 1980s and made bagpipes stamped J&R Glen, but the pipes were not made in the J&R Glen shop (which closed in the 1970s), instead they were made in the Kintail shop. Similarly, the "Peter Henderson" brand rights were bought by the R.G Hardie and Henderson bagpipes appeared once again on the market, though the original Henderson shop closed in the mid-20th Century. Being that in some circles, anything over 25 years old qualifies as "vintage," perhaps around 2030, we'll see "vintage Peter Henderson" bagpipes on eBay which were made in the Hardie shop in the 21st Century. Bottom line? Vintage bagpipes may be much newer than you think. Other warning signs can be that the pipes come with unnamed "cane drone reeds" versus modern synthetic drone reeds. Or they come with "Royal Stewart bag cover"—very commonly provided with Pakistani pipes. Or that the seller's history includes mostly piping related novelty-quality items or lots of sets of pipes that are exactly the same. Or their history includes a purchase of a poor quality bagpipe! (In the summer of 2006, one set of "Hardies"—a respected brand—was being sold by a seller who purchased, only months before, a set of suspiciously similar novelty bagpipes for about $150.) Or that in personal correspondence with the seller, he claims to play himself but can't identify any of the famous players in the piping world. Sometimes you can get a good deal on a set of bagpipes on eBay, but it's usually the expensive vintage sets selling for only a couple thousand dollars and need a little work versus several thousand dollars for a refurbished "ready to go" set through a dealer. You should always ascertain whether or not the pipes are in a playable condition and if not, attempt to learn ahead of time what will be required in order to make them so. A lot of experienced pipers watch eBay for bagpipes, so good sets of pipes more often than not sell for what they are actually worth. (Pakistani sets can often sell for more than they are worth, that's why there are so many on eBay—they are a way to make money on the uneducated!) To quote one piping instructor: "The equipment needed isn't cheap and the time required to learn is often measured in years. Bagpipes sound like nothing else and can effect people deeply, whatever possesses people to think such emotion and music can be in a bagpipe bought for $100? Are pianos this cheap someplace too? Or guitars, even trumpets?" Yes, you can sometimes get a great deal on an unidentified vintage set, but there is big risk involved. With an unknown set, only risk as much as you are willing to lose since you might end up with junk—and it's happened, even with very experienced buyers! And as with all auctions, decide ahead of time what you are willing to pay, and stick to it—don't get caught up in a bidding war. If you don't win it, just be patient, a better value may come along. 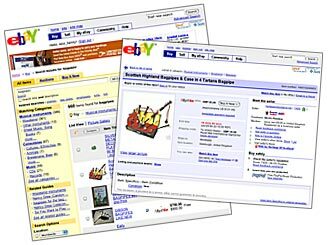 Some reputable retailers do sell on eBay and include their website address and the phone number for their shop. eBay can be a way for them to get rid of pipes that may be in perfect condition but have collected dust on a shelf for a while, or are a discontinued model, or the retailer stopped selling that brand of pipes, or it's a used set, or it may be a maker selling directly to the end user via auctions—though most makers don't do this. If you do decide to purchase a set of pipes on eBay rather than through regular retailer channels, some advice and tips follow. Request close-up clear pictures and a detailed description so that you know the condition in which the pipes are to arrive. (Again, more detailed pictures can also serve to verify that the seller actually has the pipes on hand!) Make it clear in advance that if the pipes do not arrive in the expected condition that the seller will be responsible for dealing with the carrier (UPS, FedEx, Post Office) to recoup any insurance money. Make sure the seller will accept the bagpipes back if you find that they are not to your liking. As for who pays the shipping costs back, that depends on just how far the pipes are from the seller's description of them. If they match the description but you don't like them, expect to pay the return shipping. A new piper is always going to be much better off relying on a retailer or an experienced piper for help in purchasing a trusty set of bagpipes. You'll hear it from a lot of pipers regarding eBay: "Caveat Emptor"—buyer beware! This page last updated Saturday, August 20, 2011 . Page first created in July 26, 2006.